How do we remove blight? The massive scale of blight in Detroit and urgency to address it requires that the city carry out the best practices possible to remove blight safely and efficiently. Although the Task Force recognized a wide array of possible interventions, we focused on the sensitive and complex area of deconstruction and demolition. We studied the experiences of other cities that tackled large-scale blight, such as Baltimore, New Orleans, and Cleveland, and collected the best information available to prepare our recommendations. Our recommendations put people first by addressing resident and worker safety, recognizing the need to provide economic opportunities, and creating a path to healthier neighborhood environments. The Detroit Land Bank Authority should take the lead on these activities. Environmental work is broken into two phases: survey and abatement. The environmental survey is completed during the Strategic Assessment Triage Tool (SATT) process (discussed in Chapter 5). In known high risk areas, the results of the survey provide information about the levels of asbestos and lead in a structure. Combined with the requirements of environmental ordinances, these levels define the appropriate abatement measures for each structure. The Task Force gathered information and best practices for asbestos abatement from several sources, including the Springwells Village pilot deconstruction project in Detroit, and several municipalities, including New Orleans, Baltimore, and Cleveland. The Task Force also gathered information from the U.S. Environmental Protection Agency and examined past Detroit demolition activities. Asbestos regulatory and clearance practices are well documented and well enforced in many cities across the country, including Detroit. Because of that, the protocol is similar in many markets. The nuances largely exist around the varying abatement, hauling, and dumping across regions. Division to determine its compliance with the National Emission Standards for Hazardous Air Pollutants (NESHAP). No demolition or renovation work can occur on that structure for 10 working days while the State evaluates the plan. When the plan receives the green light for compliance, demolition can proceed. During demolition, debris must be hauled to a designated section of the landfill for disposal. The Task Force supports the current regulatory process for asbestos abatement. Our strongest recommendation in this area is to complete the environmental survey, utilizing the SATT, as soon as possible once the Detroit Land Bank Authority has gained legal authority to enter the premises. The Motor City Mapping tool indicates which properties might contain blighted structures, but MCM cannot help pinpoint where the greatest deposits of lead exist. The presence, density, and type of contaminants vary widely in Detroit, and even from one address to the next on the same street. The types and ages of building systems and surfaces offer some ability to predict which buildings tend to contain lead. For example, glossy paints manufactured throughout the 20th century until 1978 typically contain lead. There are no reliable ways, however, to predict the highest concentrations of lead with great accuracy. While asbestos abatement practices are fairly well known, studied, and documented, the same does not hold true for lead. Lead exposure and abatement is still mostly uncharted territory. The current code calls for a “wet” demolition to address dust mitigation, but does not speak specifically to lead. As with the asbestos research, the Task Force discussed lead exposure and abatement with the same sources previously noted. All subject matter experts, including Detroit, are still admittedly in the learning process and using a wide variety of abatement solutions. Given the uncertainty in this area, the Task Force partnered with Detroit Future City (DFC) to gain more insight and guide our recommendations. LEAD: KNOWNS AND UNKNOWNS. Because Detroit’s building boom (the early- to mid- 20th century) coincided with the most intensive use of lead-containing materials in the construction industry, many of Detroit’s vacant structures contain serious concentrations of lead. The timing of Detroit’s fastest development almost certainly means higher concentrations of lead in its urban-architectural DNA than in cities that built out before the 20th century. We cannot always determine where lead is most prevalent in Detroit. Construction during the boom era was not contiguous, and different contractors used different materials. Maintenance practices at each property also influence the material- chemical signature of the property. The only “safe bets” are the houses that have already been burned significantly, for the greater physical depreciation, the lower the percent of total risk, in terms of blood-lead levels. LEAD: UNACCEPTABLE CONSEQUENCES OF BUSINESS AS USUAL. Surprisingly, the removal of lead from structures before demolition is not presently regulated. By contrast, Federal and State law regulate approaches to the presence of asbestos in structures under NESHAP, and the Michigan Occupational Safety and Health Administration (MIOSHA) regulates worker blood lead levels. Until April 2014, the city’s demolition contracts had specified the management of “visible dust emissions”. Without specifically mentioning lead, this procurement language lacks a clear, measured route to enforcement. Demolition contractors could essentially do whatever they want relative to lead levels, as long as they did not exceed EPA thresholds for air quality. With no adequate dust management techniques and routes to enforcement, the contaminated dust from the board-up, renovation, and demolition processes not only can contaminate the site itself, but also can travel across the neighborhood. High-force events, like demolition, tend to create larger volumes of dust, and a greater range of dust particle sizes. Another challenge related to lead contamination is in the protocol for processing materials, whether for paper pulp, burned as waste to energy, de- nailed for reuse in interior architectural projects, or processing through small wood manufacturing. If the materials are contaminated, they must be managed through a separate regulatory process and facility that changes the cost and ability of the repurposing (salvaging or deconstruction) of materials. Given the scale of Detroit’s concentrated blight removal efforts, our strategy should provide people with a high level of protection from lead contamination. However, this is likely to result in increased demolition costs and slower time frames. It stands to reason that both challenges must be resolved. The Task Force, the city and the Detroit Land Bank Authority all agree that going beyond the present legal requirements is the right thing to do. LEAD: OPTIONS AND COSTS FOR MITIGATING LEAD EXPOSURE. 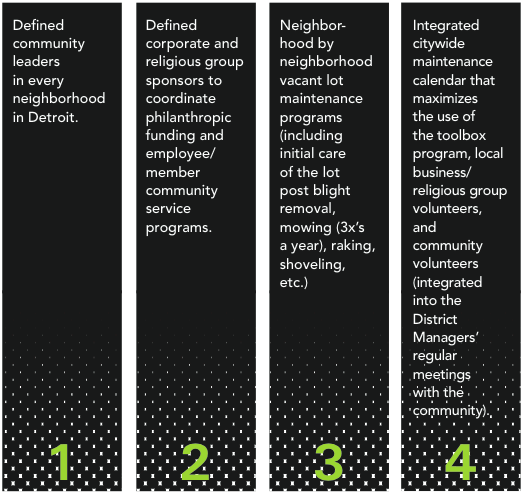 A range of options exists for addressing the unknown presence and levels of lead in Detroit. One option is to add air-quality monitoring devices to every targeted area of blight removal, and to engage community groups in educating residents. Doing this will add some cost to each project, but will also raise safety awareness among the contractors and community. At the other extreme, a full lead risk assessment could be conducted for every blighted structure in Detroit. Because the initial environmental survey in the SATT is designed to provide initial insight into the location of lead, this extreme measure does not seem necessary, feasible, or even the best way to address lead contamination across the city’s geography because the lead levels are likely to be so varied. LEAD: WHAT IS THE OPPORTUNITY FOR DETROIT AND MICHIGAN? Detroit can craft the first-ever national standards and policies for lead-safe building removal practices, and can lead by example (and necessity) with its own best practices. Through pilot initiatives, Detroit can define a mechanism for determining how to evaluate the success of a health-risk managed blight removal processes. Testing and developing this environment also creates an opportunity for additional job creation. Establishment of a baseline that draws from best practices from around the country to balance responsibility with cost and time effectiveness. Development of a pilot project (in conjunction with U.S. EPA) on an active demolition/deconstruction site to inform our work over the long term. This pilot should include a Heath Impact Assessment tool which offers a method for managing lead exposure and other environmental consequences associated with large scale blight removal. Leveraging of the pilot project to create a viable and measured way to monitor and enforce lead safety practices while demolition is happening. This should include some type of random sampling neighborhood-based air quality monitoring system and services, which can help in assuring contractor compliance. Evaluation of structural / parcel-based conditions for challenges around demolition for structures with lead exposure in densely populated areas. LEAD: WHAT PROACTIVE STEPS HAS THE CITY OF DETROIT ALREADY TAKEN? The City of Detroit, the Detroit Land Bank Authority (DLBA), and the Detroit Building Authority (DBA) recognize the lack of regulation around lead and how it is handled. At the same time they recognize the importance of creating a safe and healthy environment for Detroit residents. To that end, in April 2014 this team, along with the Michigan Department of Environmental Quality and Region 5 Environmental Protection Agency designed the approach summarized below to deal with this issue. Complete a Health Impact Assessment pilot with respect to demolition and blight removal for the Hardest Hit Fund demolition program’s six target neighborhoods. This process is intended to establish baseline conditions for tracking the health status of each target neighborhood; describing health outcomes, health determinants, affected populations in locations with respect to demolition activities and estimates of current negative health/cost burden from blight. Findings will inform recommendations for a citywide demolition and blight removal process. Provide field liaisons, who are empowered to make site work decisions including work stoppage and assign them to make regular and unannounced visits to each active demolition to monitor activities, assure compliance with best practices, and address any neighborhood concerns. Use of Bucket Claw loading technique to minimize dust transmissions by more gently handling material and minimizing debris fall distance. Completely cover all debris transport carriers before they leave the site. Thoroughly wash sidewalks and road surfaces at the completion of the project. The Task Force supports the approach outlined above and feels this is the right direction in creating a stronger process for dealing with lead. RECOMMENDATION 6-1. The city and the DLBA should continue to require “wet/wet” demolition practices for dust mitigation in the permitting process. A sense of reclaiming Detroit’s past for craft and artisanal purposes. The Task Force wants to maximize the opportunity for deconstruction, while recognizing the current market demand for harvested materials, the increased costs, and impact of an expedited time schedule. The Task Force discussed a range of opportunities and challenges around deconstruction with six firms specialized in this type of removal. These discussions led us to select residential structures of four units or less as the best deconstruction candidates in Detroit. The current resale and wholesale distribution market can support deconstruction of only about 10 percent of Detroit’s present inventory of blighted structures in this category. That means that, under today’s conditions, about 7,000 buildings can be cost- effectively deconstructed and recycled. Even this modest volume would result in an estimated 30- 35 new jobs in deconstruction and salvaging. An as-yet unexplored reason for deconstruction is the opportunity to bring the practice to a more ambitious scale of wholesale, through removal of significant quantities of building materials, especially roofing, trusses, and flooring materials. Although the capacity for this does not yet exist, the Task Force recommends exploring opportunities for wholesale-level engagement in deconstruction in the very near future. Full deconstruction is just what it says: removing a structure entirely through manual deconstruction intervention. This practice usually takes anywhere from five to seven days or longer, depending on the size of the structure and costs approximately 50 percent more than mechanical demolition. Hybrid deconstruction is gaining momentum in other markets across the Midwest. The hybrid method combines the presence of human beings on the site, along with an excavator. This variation of traditional deconstruction speeds up the work by using the excavator to carefully assist the manpower on the ground by gently pulling down walls, porches, roofs, staircases, and major elements. A crew of individuals can then get at these more easily, whether on site or for transport to a warehouse to be taken apart manually. This practice usually takes anywhere from one to three days, creates a lot of dust, and costs approximately 25 percent more than mechanical demolition. Partial demolition, sometimes referred to as the “skim” model, is a nuanced version of the full deconstruction model. A “skim” model of deconstruction delicately balances the input (labor cost) with the throughput (salvaged materials of value) over a much shorter period of time -- one to three days versus five to seven days or longer for full deconstruction. Typical materials manually removed from the structure under a “skim” method of deconstruction are the higher-market resale items such as hardwood floors, trim molding, stained glass windows, doors, and door jams. In addition the estimated cost increase is only 10 to 12.5 percent more than mechanical demolition. The structure has fallen into a particular level of decay due to neglect, the elements, or a previous fire, and there is little or no salvage value remaining. RECOMMENDATION 6-7. The Task Force recommends that the Detroit Land Bank Authority (DLBA) schedule all utility disconnections as soon as the contractors complete data gathering via the Strategic Assessment Triage Tool. The greatest practical challenge to prompt demolition in Detroit has been disconnecting the gas, electricity, and water lines to the property. Disconnecting utilities involves communication and timing issues among two different utilities and the city. Landfills in southeast Michigan have plenty of capacity to support the entire scope of blight removal suggested in this report. In fact with so much capacity, the prices for using Detroit’s landfills are low, inviting debris even from Canada. Still notwithstanding this capacity, the goal should be to recycle rather than filling up our existing landfills. The largest single cost factor for demolition in Detroit is the cost of trucking debris from the city to these landfill locations, which are generally located at least 30 miles from Detroit. Any recycling solution for the City of Detroit must therefore be located within the city limits. This would reduce the average demolition cost dramatically, considering the offset from recycling versus the hauling, fuel, tipping fees and limited hours of operation at the landfill. Recycling centers within the city of Detroit would also keep revenue from this project in the city, creating jobs for Detroiters. A recycling materials market must exist for recycling centers to make the investment in Detroit. Funding sources for deconstruction and demolition must be defined to support the need for recycling centers as well as contractor growth. The potential cost savings of two recycling centers within city limits is approximately 10 percent of total demolition cost per structure. If the average cost of demolition, including any deconstruction, is $10,000, this could save at least $1,000 per demolition project. Assuming approximately 72,000 structural demolition candidates, this could result in a cost savings of up to $72 million. Locating two recycling centers within the city would cut the average trucking distance by one-half for demolition contractors. Contractors could also pay lower tipping fees through large-scale, pre- negotiated contracts with the Detroit Land Bank Authority. In addition, an anticipated 120 new jobs are possible through the creation of two recycling centers. RECOMMENDATION 6-10. The city should establish two new construction and demolition (C&D) recycling centers inside Detroit city limits; ideally, one on the east side and one on the west side of town. The Task Force sub- committee talked to three potential recycling center candidates, all with plausible business plans. All three candidates bring slightly different options and expertise, but may not represent the entire population of interested parties. Large-scale, commercial structures include commercial structures with lot sizes greater than 25,000 square feet, and industrial structures. These structures are unique because of their larger size and their potential for greater environmental issues than other structures. Average costs for demolition can range anywhere from $1 million to tens of millions per structure. Although this category only represents a total of 559 structures, just 0.7 percent of the total structures that meet the Task Force definition of blight or have blight indicators in Detroit, they still represent a significant footprint in the city and need intervention. Without a solution, they will continue to exert a downward pull on any efforts to restore the neighborhoods in which they are located, and as well as on the city as a whole. Blighted, large-scale, commercial facilities are typically addressed by economic development teams, working to reactivate these sites and create jobs for a city. Detroit Future City (DFC) and the Detroit Economic Growth Corporation (DEGC) are already working side by side to overlay targeted primary and secondary employment districts in Detroit—based on the best available information about where the city’s jobs already exist or could grow—with DEGC’s economic development job creation strategies. The Task Force supports continuing these efforts while expanding the strategy to address both job creation and neighborhood recovery, reinvestment, and stabilization. A balanced two-objective approach is recommended in addressing large- scale commercial blight removal. This approach would balance the need to shore up tipping-point neighborhoods, while at the same time working toward investment and job creation. Use of Motor City Mapping to reveal how many of the city’s 559 large-scale industrial structures and commercial structures are located within the overlay districts (see map on opposite page) and are high target candidates for job creation opportunities. RECOMMENDATION 6-15 Detroit Land Bank Authority (DLBA) should require deconstruction companies and demolition companies to submit combined proposals (potentially through a joint-venture), working together to maximize coordinated timing and hand-off between deconstruction and demolition activities, where deconstruction is a viable option. RECOMMENDATION 6-16 DLBA should continue to package mechanical demolition RFPs in two ways: by size of job and size of contractor. This method allows larger contractors to secure larger jobs, which should improve the ability to recognize cost savings, process efficiencies, innovation and job creation. Smaller contractors typically do not have the financial capacity to secure the necessary bonds, the experience, nor the resource bandwidth for these larger projects. Some RFPs of notably smaller size should be dedicated to the smaller contractors. The Task Force recommends RFPs in this small pool to represent approximately 10 to 50 properties each. RECOMMENDATION 6-17 The Task Force calls on local banks and other financial institutions to grow Detroit based businesses by extending the DLBA lines of credit at three percent interest or below to aid in cash flow to contractors. These funds provide the necessary working capital for the DLBA to hire local contractors to revitalize Detroit neighborhoods. Banks should explore programs such as the Community Reinvestment Act (CRA) for this purpose. These funds should be backed by the Federal and State funding programs to allow the DLBA to pay contractors within 30-45 days of project deliverables and billing. This addresses major cash flow challenges that contractors face once they win RFPs. Since many Federal and State funding programs are on a reimbursement basis, they do not forward funding to DLBA to pay the contractors until the work is completed, which usually requires at least a 30-day turnaround. For many of the contractors, especially the smaller ones, the delayed cash flow makes it almost impossible to meet payroll. RECOMMENDATION 6-18 DLBA should continue to prioritize Detroit based businesses when awarding RFPs. If firms outside of Detroit are needed to achieve targeted volumes they should be required to hire qualified Detroit residents to perform the work. Contracted firms should be required to work directly with the job training agencies listed in the Job Creation section of this chapter to refine employment candidate training requirements and offer employment opportunities for graduates. Blighted vacant lots can attract trash, dangerous and/or overgrown trees, overgrown brush, abandoned cars and boats, tires, and more. In addition to being an eyesore, these lots often become unsafe. Crimes happen behind overgrown trees and brush. Children naturally sometimes see these areas as playgrounds, tempting but dangerous places that offer more—and worse—than playful adventures. Publicly owned vacant lots already represent over 84,000 of the 114,000 vacant lots in the city, and public ownership will significantly inventory as title of many blighted properties ends up transferring to the Detroit Land Bank Authority through nuisance abatement and foreclosure. Ridding blighted structures and clearing vacant lots achieves the Task Force mission of blight removal, but it also creates an environment that must be maintained. The Detroit Land Bank Authority will have the responsibility of maintaining tens of thousands of vacant lots until they can be repurposed, with no funding to do so. For the thousands of vacant lots under public ownership, another barrier exists: legal authority to access the site. Two notices must be issued in Detroit to attain legal authority to go on these sites. First, the Department of Recreation must issue a notice of noxious weeds and brush. The contractor must wait 10 days after the notice is issued to legally access the site. The second notice is from the Department of Public Works (DPW) and addresses trees on the property. Ten days following the DPW notice, a hearing is held, followed by another 10-day wait period before the contractor can access the site. Even if simply clearing vacant lots were the solution, Detroit would be greatly challenged. Unfortunately, the challenge of vacant lots does not end with clearing them for the first time, or the second, or the third. Without maintenance and care, vacant lots are attractors for continued blight. Many cities across the country are faced with this issue. No city has faced the level of vacancy of Detroit. 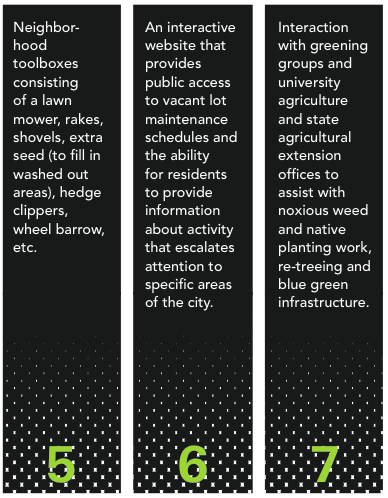 Already in Detroit, however, there are several best practices and existing programs from which we can glean insight and create a model that suits Detroit’s unique need for clearing and maintaining vacant lots. CLEARING AND MAINTAINING VACANT LOTS: INITIAL CLEARANCE RECOMMENDATIONS. RECOMMENDATION 6-19. Working with the communities through community meetings, the Detroit Land Bank Authority (DLBA) should develop a directory of the vacant lots to be cleared. Once the MCI geographic prioritization is defined, the DLBA should be able to identify blighted vacant lots which have the greatest impact from clearing. RECOMMENDATION 6-20. Once priorities for vacant lot clearance have been finalized, the DLBA should immediately work with local nonprofits to begin fundraising. Once funds have been raised, the DLBA should work directly with DPW and Department of Recreation to issue notices and RFP’s to begin lot clearing. MAINTENANCE: A CALL TO ACTION FOR EVERYONE. The city needs help just to mow and maintain most existing vacant lots. The vacant lots currently owned by the city or targeted for blight removal have a wide variety of grasses, trees, brush, and weeds on site. Given the costs associated with clearing and re-seeding tens of thousands of vacant lots, the Task Force recommends just mowing and maintaining the existing growth. A program such as this will require start up funding to create toolkits and develop communication tools, funding mechanisms and processes. As a jumpstart to this program, Rock Ventures will contribute the first $100,000 (through its current Brightmoor agreement with the DLBA), utilizing the Brightmoor community as a pilot for program development. As a result of the current blight removal programs, there are soon to be over 500 vacant lots resulting from structural blight removal and vacant lot clearing. In addition, once the program is built, Rock Ventures commits to coordinating a minimum of 5,000 volunteer hours through the vacant lot maintenance program. two recycling centers are located within city limits. Based on these assumptions and the market capacity information gathered from contractors, recycling operators, and training organizations, the Task Force projects the potential for 430 new direct jobs. The amount of job creation anticipated from blight removal activities creates an opportunity to leverage several training programs already active in Detroit. For example, Detroit Employment Solutions Corporation is already planning to train 300 job placement candidates through their Detroit Registered Apprentice Program (DRAP) general laborer apprentice program. The Jobs & Economy team should partner with Detroit Employment Solutions Corporation to leverage additional training solutions from all or a combination of the organizations listed below if demand is created. The job creation potential within the environmental area is within asbestos inspection and abatement. The recommended lead abatement work should be performed and integrated into the demolition contractor duties. Experts in providing licensed asbestos training estimate that 90% of the environmental inspection companies are comprised of only one owner/employee, and ramp up to a typical maximum of five people based on volume. They had independently been projecting the need of 53 inspectors to support 80,000 demolitions. The training firm feels confident that there are approximately 40-50 licensed, capable asbestos inspectors in Detroit that are currently working in other, less attractive markets. With the commitment and ramp up of blight removal work in Detroit, it is anticipated that the majority of licensed inspectors in the area would turn to these projects for work. If we assume 40 existing inspectors are available, then we would need to train an additional 13 to meet anticipated volumes. Currently there are 3,700 licensed asbestos abatement professionals in Michigan, of which approximately 400 reside in the Detroit area. Based on the same workforce projection exercise noted above, trainers anticipate the need for approximately 600 licensed asbestos abatement professionals, which equates to a gap of 200 new jobs. One of the many insights that were gleaned from the Springwells Village pilot project was baseline workforce projections related to deconstruction. Through discussions with several experts associated with the deconstruction industry, it was determined that the current recycling and salvaging market could only support approximately 10% of the structures targeted for removal, or 7,000 projects over the next five years. This equates to 117 deconstruction projects per month. The Springwells project team comprised of a six-person crew (a supervisor and five general laborers) which could support 10 skim deconstruction projects per month. Based on that information, we anticipate a total workforce need of approximately 72 people. With approximately 40 in the workforce today, that would result in approximately 32 new jobs. Based on the expertise of Detroit contractors, demolition crews typically consist of between five to seven workers. To achieve demolition of 1,200 structures per month, contractors would need to activate approximately 48 demolition crews or between 250 to 300 workers. There are at least three to four larger contractors licensed with the City of Detroit that have the financial and management resources to ramp up to as many as eight crews. Therefore, the larger contractors could address up to 32 of the needed 48 crews, redeploying employees that are currently employed and adding 50-60 new jobs. There are currently 19 contractors licensed with the City of Detroit. If we assume 4 of them represent the larger contractors above, that leaves 15 small to medium size contractors to address the remaining 16 crews needed to support the monthly demolition volume. If we assume each contractor has at least one crew, the gap is narrowed to one additional crew of six is required. The Task Force is assuming 60 jobs can be created through growth of demolition contractors. Based on conversations with several Detroit construction contractors, establishing two new strategically placed construction and demolition recycling centers would result in immediate demolition cost savings and job creation. Ideally located inside the city limits; one on the east side and one on the west side, these recycling centers could save up to $1,000 per demolition project. Assuming 72,000 structural demolition candidates, this could result in an overall cost savings of up to $72 million. In addition, the same two recycling centers have the potential to create 120 direct general laborer jobs for Detroiters. In order to keep the Motor City Mapping database up to date, all 380,000 parcels in the City of Detroit should be surveyed annually. The Detroit Land Bank Authority (DLBA) will work directly with Data Driven Detroit, and Loveland Technologies to the extent necessary, to hire full time resources to constantly survey Detroit. Additional resources will be hired to perform data management responsibilities to ensure accuracy of data to the DLBA and community members.